President Bush called Thursday for democratic reforms in the Middle East, saying that "freedom can be the future of every nation." Mr. Bush said the stakes were particularly high in Iraq, where a U.S.-led coalition toppled Saddam Hussein's rule. "The failure of Iraqi democracy would embolden terrorists around the world," the president said. The president said he embraced the view that the global wave of democracy has barely reached the Arab states. But he is confident that u.s.-led efforts in Iraq will pay off and point the way for tyrannies such as Syria and Iran, reports CBS News White House Correspondent Mark Knoller. 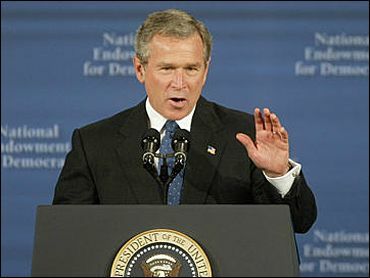 Mr. Bush spoke to the National Endowment for Democracy, a group that champions democratic gains around the world, on the same day that he was signing an $87.5 billion package approved by Congress for military and reconstruction operations in Iraq and Afghanistan. He said the United States and other nations shared blame for the lack of democratic freedoms in the Middle East. "Sixty years of western nations excusing and accommodating the lack of freedom in the Middle East did nothing to make us safe because in the long run stability cannot be purchased at the expense of liberty," Mr. Bush said. "These are not the failures of a culture or a religion," the president said. "These are the failures of economic and political doctrine." He said countries like Iraq and Syria had promised their citizens national honor but left instead a legacy of torture and oppression. "As long as the Middle East remains a place where freedom does not flourish, it will remain a place of stagnation, resentment and violence ready for export. And with the spread of weapons that can bring catastrophic harm to our country and to our friends, it would be reckless to accept the status quo," Mr. Bush said. As a result, he said the United States "has adopted a new policy," which he described as "a forward strategy for freedom in the Middle East." "This strategy requires the same persistence and energy and idealism we have shown before — and it will yield the same results," he said. "We believe that liberty is the design of nature. We believe that liberty is the direction of history." Mr. Bush heralded steps toward democracy in some Mideast nations, mentioning Morocco, Bahrain, Saudi Arabia and Egypt. "Many Middle Eastern governments now understand that military dictatorship and theocratic rule are a straight smooth highway to nowhere." He said Saudi Arabia was taking the first steps towards reforms with elections with plans for its first local elections. "By giving the Saudi people a greater role in their own society, the Saudi government can demonstrate true leadership in the region," Mr. Bush said. He said that Egypt, another powerhouse in the region, "has shown the way toward peace in the Middle East and now can show the way toward democracy in the Middle East." "Champions of democracy in the region understand that democracy is not perfect," Mr. Bush said. "It is not the path of utopia…"
Mindful of concern about the influence of the United States, the president said, "As we watch and encourage reforms in the region, we are mindful that modernization is not the same as westernization." "Representative governments in the Middle East will reflect their own cultures. They will not and should not look like us."